This really is just a posting about random thoughts and a short one at that. (Phew! I hear you say.) I went to an interesting talk about the Human Rights Act and whether it is a good thing or not by Guy Herbert, the man who runs NO2ID. His conclusions were not quite what people might expect, unless you knew Guy and his habit of thinking every issue through to the logical and unpalatable end. During the discussion, almost inevitably, the subject of Magna Carta came up with somebody arguing that a great deal of the discussion is conducted on an emotional level. Thus, people who were "against" the Magna Carta were deemed to be bad or very bad whereas those who were "for" it were obviously the good guys. He was not talking about the actual participants of that event in 1215 but about people who talked about the subject now. How, I asked, can one be for or against something that happened in the thirteenth century and was, whichever way you look at it, of some importance in this country's history? That reminds me of the possibly apocryphal story about Thomas Carlyle hearing that Margaret Fuller said that she had decided to accept the universe. "Gad!" - said the great conservative sage. - "She'd better." Of course, one is for Magna Carta but what one might be against is the hysteria that is already growing around that event, important though it was, the political shenanigans that we shall see with different parties claiming that mediaeval document for themselves and, of course, the miasma of inevitability that will surround so many of the discussions. Magna Carta in 1215 ergo Britain being uniquely free and democratic. Not so, but far from it. The British Library is, as everyone knows or should know, one of the finest institutions in the world with a wonderful collection of books and helpful staff in the reading rooms, fascinating exhibitions, a superlatice collection of stamps for those who find the subject interesting (alas, TH seems to have got over that particular obsession some years ago) and a publishing arm of some distinction. In particular, Tory Historian has been overjoyed by the Library's decision to reprint detective stories from the Victorian period and, more recently, from what is known as the Golden Age that have been forgotten by all except a few historians of the genre. It may be added that not a few of the better known "historians" who are constantly interviewed and commissioned to write articles on the subject know very little beyond the best known authors. But that is another and more painful story that requires at least one separate article. In the circumstances, the British Library is doing us all a favour by publishing books that are of importance in the history of the genre but have fallen into a literary memory hole. Tory Historian has read several of the published offerings and fully intends to read the others as well as any new ones that the Library will publish some time in the future (rumour has it that there are various plans in that direction). 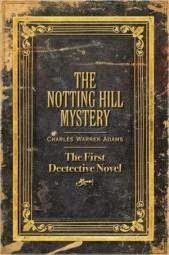 The Notting Hill Mystery by Charles Warren Adams is, contrary to popular assumptions about Wilkie Collins' The Moonstone the first detective novel, having been serialized in Once A Week in 1862 - 3. In other words it predates both The Moonstone and Emile Gaboriau's first M. Lecoq novel, published in 1869 in two volumes, though Gaboriau's L'Affaire Lerouge was serialized in 1863. Anyway, the British Library has now republished The Notting Hill Mystery and everyone can start making comparisons with the better known novels. Structurally it is not dissimilar from The Moonstone in that it is a collection of depositions from various people who were involved in greater or lesser degree in the nefarious dealings of the sinister Baron R ___, who is suspected of murdering his wife. The story starts some years before with the birth in particularly shocking and tragic circumstances of twin girls. The evidence is collected painstakingly by Ralph Henderson, an insurance investigator, the very personification, one might say, of the genre and of the investigating detective, being a middle class professional gentleman who is used to collecting evidence in a painstaking manner. Sadly, Tory Historian, a great fan of Wilkie Collins's works and not only of the best known two novels and one story (The Biter Bit, which is frequently anthologized), did not find Charles Warren Adams's book fascinating though it ws, quite as good as either The Moonstone or The Woman in White, perhaps because the story was a little too obvious and too sensational (very much of its time) and, more to the point, the characters did not shine the way Collins's do. For all of that, The Notting Hill Mystery is very well worth reading by anyone who has the slightest interest in the history of detective novels or sensational literature and by anyone who might be interested in the history of that area of West London. 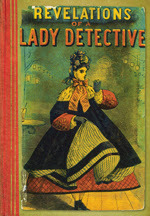 The British Library has also reprinted the three earliest collections of adventures by women detectives, who are employed as such, sometimes privately as in Mr Bazalgette's Agent, sometimes by the police or in a private capacity as in The Female Detective and the one TH has read, Revelations of a Lady Detective. This collection of adventures belongs more to the Victorian sensational novels than to the detective fiction as developed by Sir Arthur Conan Doyle and his rivals and successors of the Golden Age but Mrs Paschal, the heroine/narrator does display great abilities of ratiocination as well as a determined attitude towards the catching of criminals and the claiming of whatever reward might be offered. In the first story she resolutely discards her crinoline (described by her as hateful) in order to pursue the criminal; in others she unhesitatingly disguises herself even as a possible novice in a nunnery run by a very sinister Abbess. Of the available Golden Age detective fiction Tory Historian has read two by John Bude (pseudonym of Ernest Carpenter Elmore), both introduced by a present-day practitioner of the art and highly knowledgeable historian of the genre, Martin Edwards, The Lake District Murder and The Cornish Coast Murder. The latter of these was, in fact, published first though both came out in 1935. They were slightly unusual for the period in that they took place in very precisely described English locations, which was not London and not an imaginary county somewhere in the Midlands or the Home Counties. Both are very much of the Golden Age with clever mysteries and painstaking deduction, following up of clues and of various time tables. In fact, they belong to what might be called the Freeman Wills Crofts school of detective fiction but in Tory Historian's opinion John Bude was a better writer. The Cornish Coast Murder is a mixture of police and amateur investigation, with Inspector Bigswell, a fairly intelligent police officer together with his subordinates and superiors representing officialdom and the Reverend Dodd, the local vicar and detective story addict together with his friend and fellow addict, the local doctor, representing the amateurs. On the whole, the amateurs win but the officials do not come out too badly. 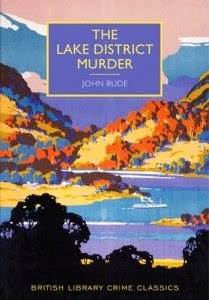 The Lake District Murder introduces Inspector Meredith, who becomes Superintendent by the end of the book, largely in recognition of the way he solves the case in question. There are no amateurs and the work is done entirely by the police team, which appears to have a remarkably large manpower at its disposal. Inspector Meredith is a likeable and hard-working chap with a long-suffering wife and an eager-beaver son who is apprenticed to a photographer but would probably like to go into the force himself. He has a good relationship both with his superiors and his underlings. In fact, there is a clear indication of police work requiring a team to achieve the desired result. It is, for instance, the Superintendent who understands how the murder was done though Meredith had worked out, following up clues and information provided by his staff, who had done it and why. 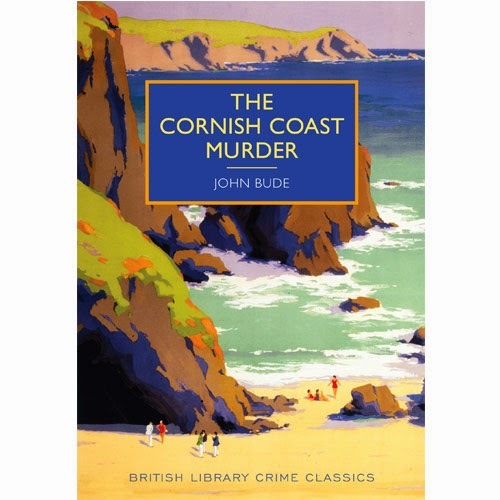 Having read The Lake District Murder, Tory Historian decided to try another novel by John Bude while waiting for The Cornish Coast Murder to make its way back to London Library. Such is the influence of the British Library reprints that only one Bude book could be found on the shelves, Death in Ambush, published in 1945 but one that clearly belongs to the inter-war period. Unfortunately, this turned out to be greatly inferior. The writing is still witty and attractive (still better than Freeman Wills Crofts's) but the plot is considerably sillier than the one in the Lake District or, as it turned out, the one on the Cornish Coast. One murder method is very clever but the second one is complicated to the point of ridiculousness. The only reason nobody understands it to the very end is because there is no autopsy despite death being highly violent. Superintendent Meredith is now in Scotland Yard and back to being Inspector; his wife has effaced herself almost as much as Inspector French's does in the Crofts series and there is no mention of the son at all. He investigates the two crimes almost accidentally as he happens to be staying with his friend, the Watson of the book, a successful detective story writer, Aldous Barnet, who finds most of the clues and manages to elucidate the cause of the second murder. Meredith rushes around, accusing first one person then another of the crime and demanding an alibi from the accused. Otherwise, he says darkly over and over again, the prosecutor will make hay. The notion that it is he who has to produce the evidence does not seem to occur to anyone. Eventually, the last person standing, so to speak, turns out to be Second Murderer (the first murder is sort of solved earlier in the book) and a couple of vital clues are discovered not to be revealed to the reader until the last explanation to Meredith's superiors. In fact, something of a mess. Fortunately, The Cornish Coast Murder turned up and made up for Death in Ambush. The British Library is planning to reprint at least one more novel by John Bude. Let us hope it is more like the first two and not like the later one. There will be further reports on the British Library Classic Crimes series. The Conservative History Group will be holding a meeting on November 24 in the House of Lords in Committee Room 1: Professor Steven Fielding and Michael Dobbs will speak on Politics in Fiction - from Disraeli to Dobbs. You may think that one of the speakers will not be able to avoid a few references to himself but I couldn't possibly comment. Steven Fielding is Professor of Political History at the University of Nottingham. His new book, A State of Play, explores the depiction of British politics in fiction, from the reverence of Anthony Trollope to the cynicism of The Thick of It. Drawing on a wide range of material - from Yes Mininster and the novels of H.G. Wells to less obvious sources such as Steptoe and Son and the works of Agatha Christie - he argues that these depictions have played an important but insidious part in shaping how we think about our democracy and have helped to ventilate the British public's many frustrations with Westminster. Prof. Fielding will be talking to us about his book, focusing particularly on the way Conservatives have been portrayed down the ages. He will be joined by Michael, Lord Dobbs, the political author and creator of one of the most famous fictional Tories - Francis Urquhart of the House of Cards trilogy, which has now spawned award-winning TV adaptations on both sides of the Atlantic. Attendance is free but it is advisable to book here. Ahem, I seem to have blogged about one of the speakers in another place, here and here. The talks should be interesting, though. Try and get to the event if you are anywhere near Westminster that evening. That anniversary is coming and many preparations are being made, some attractive, some less so. One cannot help suspecting that a great deal of nonsense will be written and spoken (indeed, already are written and spoken) on the subject as well as a great deal of sense. The British Library is bringing together all four existing versions of that great document but, it seems, only for one day. There is a ballot for 1,215 people "to be part of history" and to take advantage of "the unique opportunity to see all four Magna Carta documents at the British Library in London". Despite those words I considered taking part in the ballot but abandoned that idea when I read about the circus I would have to submit to, should I win (an unlikely event but one must consider all possibilities. On arrival, winners will be welcomed to the British Library by historian and TV presenter Dan Jones, who will explain the history and significance of Magna Carta. To the sound of live medieval music in the British Library’s entrance hall, winners will then be taken by costumed characters from the 13th century to view the four original Magna Carta manuscripts on display together for the first time. One can only hope that there will be other exhibitions and events without the faux mediaeval atmosphere. In the meantime, this blog will indulge in some random thoughts on the subject of the Great Charter and related events. The first random thought came to me as I considered other countries in which similar documents were produced, one of them, Hungary, then a great kingdom, where the magnates forced King Andrew II to sign The Golden Bull in 1222. (Here is a somewhat more romantic view of the event that reminds one of many a comment about the Magna Carta.) 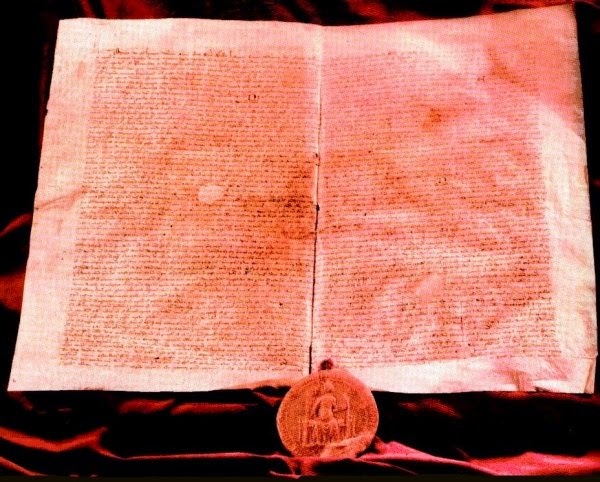 The notion of The Golden Bull being Hungary's Magna Carta is not particularly odd as anyone who compares the Articles of the two documents can see. Of course, what with the Mongol invasion, subsequent wars and the Ottoman occupation, Hungary's history turned out to be somewhat different from England's though even the latter saw the imposition of authoritarian government under the Tudors as well as a civil war or two. Here is what the historian László Kontler says on the subject in his carefully argued book, A History of Hungary. In 1222, the country-wide movement of the servientes compelled Andrew II to issue the famous Golden Bull, sometimes mentioned as a counterpart of the English Magna Carta of 1215. Most of its thirty articles concerned the encroachment of the king and his barons and the unlawfulness of these as well as the alienation of large royal estates, but the ones most important for posterity decreed the uniform rights and privileges of the nobility: the exemption from taxes and from quartering troops, from the jurisdiction of others than the king and thepalatine, the freedom of the servientes from harassment by the barons, the requirement of a legal warrant to detain them, etc. An additional clause invested the secular and ecclesiastical lords with a right of resistance in case the aforementioned were violated by the king; a clause rarely invoked during the rest of the Middle Ages, but all the more often during the long period of Hungary's association with the House of Habsburg. However much of a mere plot the movement of the servientes, and however rudimentary the Golden Bull was, these were the beginnings of a process in which the idea of communitas regni became influential in Hungary and an estates based parliamentarianism developed, and groups outside the royal council had access to policy-making (for the first time at the assembly of 1277). Of the many opposition movements [to Andrew II] the most important was that of the so-called royal servientes. "Servants" by name, they were in fact the freest agents in a society where even the relatively independent jobbágy warriors were high-placed subjects within the manorial system; the servientes themselvese were landlords, small or great, and possessed subjects, few or many, and called themselvess "servants of the king" because it was only to the king that they owed service and obedience - not as their landlord but as the ruler of the country. The concepts and ideas are not unfamiliar to those who know English mediaeval history and neither is that of communitas regni: as this dictionary of mediaeval legal terms explains it is "the Community of the Realm; the general representation of the nation in Parliament". There were some differences, obviously, one of which was the murder of Queen Gertrude, Andrew II's German wife who had brought with her, as was usual, large numbers of courtiers and relatives, whose influence and privileges were resented by the Magyar nobility of whatever status. This story is told (somewhat romantically and patriotically) in József Katona's play Bánk bán (1819) that was performed at the National Theatre on March 15,1848 and in the opera by Ferenc Erkel (1861) that was performed in the Opera House on a crucial day in 1956. The opera has a very fine patriotic aria sung by Bánk bán himself. None of this aims to diminish the importance of Magna Carta. Indeed, it is possible, as Wikipedia says, that "[i]t may even have been inspired by Magna Carta, as its greatest supporters met with exiled Magna Carta leaders such as Robert Fitzwalter during the Fifth Crusade". And that would make the influence of the Great Charter even more obvious. Captain Frederick Burnaby has appeared on this blog before (here, for example) and deserves a great deal of attention. 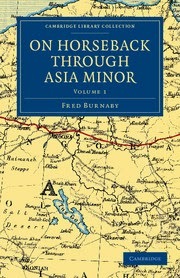 It so happens that I have recently finished his second book of adventures to do with Russia, whom he did not trust in the slightest, On Horseback Through Asia Minor, written and published in 1877. Burnaby asked Mutasaraf Pascha whether there were any names in the papers that had been taken from the Russian agent. Yes, names implicating some very high Russian functionaries. I hope that we shall soon be engaged in hostilities with Russia. Ever since the battle of Sedan she has been secretly at war with Turkey, and trying to stab us under the guise of friendship. Ignatieff encouraged Abdul Aziz in his extravagance. He knew this would lead to bankruptcy and to a rupture of the alliance with England; and you may depend upon it, that the Russian Ambassador was one of the first men to advise his majesty to repudiate the debt. They are very clever, these Russian diplomats and however poor Russia may be, she has always enough gold to sow the seeds of sedition and rebellion in her neighbour's territory. You will find this out for yourselves one day. This was meat and drink to Burnaby who considered that Russia was a definite threat to India as well as to Constantinople. Later, especially under the Soviet regime it became obvious that poverty and even famine could be disregarded if money was to be spent on propaganda and destabilization abroad. As to sowing the seeds of sedition and rebellion, it is possible that many Ukrainians, Georgians and Moldovans would agree with the Turkish official. This September's issue of the Conservative History Journal (the printed edition) published by the Conservative History Group concentrates, understandably, on the two great anniversaries: 100 years since the beginning of the world-shaking war of 1914 - 1918 and 300 years since the Hanoverians assumed the throne of this country with their descendants still there. They have not yet overtaken the Plantagenets in their longevity as a ruling dynasty but they are well on the road to it. Lord Lexden, official historian of the Conservative Party (and who could fill that position better?) and Chairman of the Conservative History Group has a long article on the transition from the last Stuart Monarch, Anne to the first Hanoverian one, George I and what that meant in political terms for the two parties: the Tories and the Whigs. He explains very clearly how the Tories mismanaged their affairs to the extent they did and how they lost their political supremacy (brief though it was) to the Whigs who maintained it more or less for the rest of the eighteenth century. Lord Lexden also gave a talk on the subject at the Carlton Club on October 9. Frequent elections, required under the Triennial Act of 1694, ensured that the country as a whole was divided as sharply and passionately as Parliament itself. Both parties had highly developed organizations which attracted abundant support in the constituencies amongst voters and the unenfranchised alike (the latter enjoyed the excitement and money that elections brought), and both maintained close links with journalists and pamphleteers committed to their cause in a country where literacy rates were high by European levels (perhaps nearly two-thirds of men and one-third of women). Naturally, things did not work out quite as planned, partly because of Queen Anne dying and partly because of the in-fighting within the party as well as sympathy for the Jacobite cause expressed by some Tories. It would be useful if people who talk loudly about politics being particularly venomous at the moment would spend a modicum of time on reading history. They might find much to surprise them and to put "the present discontents" into perspective. Dr Barton was a fascinating character, a doctor and a writer of mystery stories (not an unusual combination) but mostly a collaborator with other writers like L. T. Meade and, in the case of one novel, Dorothy L. Sayers. He supplied the outline of the plot and the scientific details about which there was a great deal of discussion in various letters and scientific journals after the book's publication. So far as Tory Historian who is, most definitely not a scientist, can tell, the general view now is that the detection of the crime is entirely possible but there might be more recent theories that say otherwise. Catherine Kenney discusses his role in the creation of the book here as part of her own study, The Remarkable Case of Dorothy L. Sayers, mentioned on this blog before. I am so glad you like Lord Peter. I certainly don't intend to kill him off yet, but I think it would be better to invent a new detective for any tales we do together. For one thing, people would associate his name with mine and be inclined to hand me out more than my half-share of credit for the story, which wouldn't be just. Also, it would simplify matters to have somebody with more scientific surroundings, don't you think? Lord Peter isn't supposed to know a lot about chemistry and that sort of thing, and it would mean inventing a docotr or somebody to help him out. Also, I'm looking forward to getting a rest from him, because his everlasting breeziness does become a bit of a tax at times! A whole list of reasons for not writing a novel about Lord Peter in collaboration with "Robert Eustace" but what one cannot help feeling behind it is a reluctance to share the character and his associates. They are her creation and hers they must remain. Which raises a question or two about Ms Paton Walsh's calm appropriation of them all. Interestingly the first volume of the letters that takes up the story to 1936, with the last complete Lord Peter Wimsey novel, first written and produced as a play, Busman's Honeymoon, does not solve the mystery of why he and his entourage were abandoned. 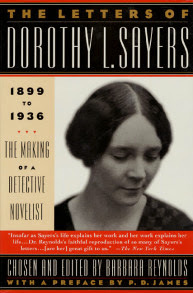 Sayers did not comlete the novel she started that year, Thrones, Dominations, later completed by Paton Walsh, and produced only odds and ends about the Wimseys and those around them: a couple of short stories and a series of letters, published in The Spectator in 1939 - 40 as part of her war effort. There are indications in the letters of 1935 and 1936 that Sayers was planning further adventures. There are references to Viscount St George (Wimsey's nephew and the heir to the Dukedom of Denver) coming a cropper matrimonially (to Helen Simpson 25 March 1936) but also losing his life (eventually she told somebody that he would be killed in the Battle of Britain but she could not have had that in mind in 1936)), leaving Lord Peter as the "heir to those damned strawberry leaves" (to Donald Tovey 22 November 1935). In the same letter she outlined plans for tidying up the chronology a little and to dispose of various ladies in Lord Peter's pre-Harriet life. She certainly made plans for Thrones, Dominations and produced ideas for the Wimseys' future. None of that seems to have materialized and though Tory Historian has read various theories by authors who had known the lady and others who had not but read everything by and about her (TH has a long way to go), none of them seem completely satisfactory. Possibly, she did suddenly get bored with the whole menage but that does not mean that she would have liked someone else appropriating them.